Anna, the star of our Canine Section (in a field of one) has been busy again. 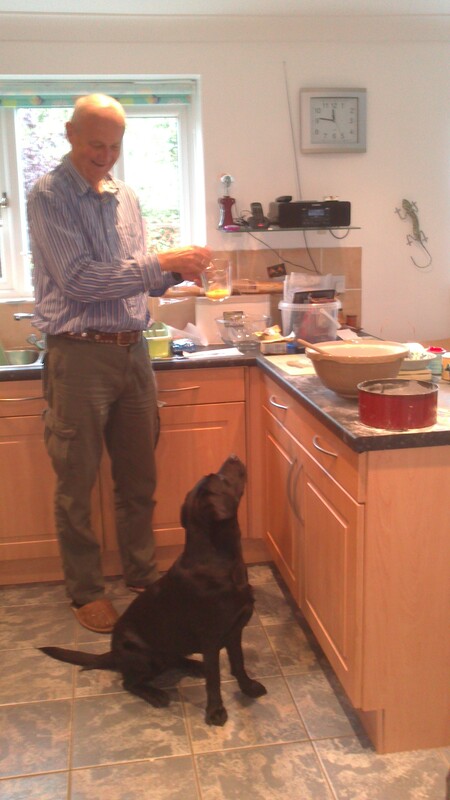 She is now quality tester to Andy’s fruit and ginger cakes (that is, one fruit and one ginger cake rather than a melange of fruit and ginger in a gynormous multi-bake). This is a pivotal and crucial role as the Work Team are notoriously fickle eaters. The Catering Team, headed by Gill “Jam Sponge Square Pants” Thomas and her two assistants Andy and Jan, provide delicious and varied patisseries for the hard working navvies. Anna gave the fruit cake seven barks and the ginger cake a whopping ten wags. They were both passed unanimously by a show of paws. Many thanks to Gill, Jan, Andy and Anna, who all give Mary Berry a run for her money. Well, okay, just a walkies for her money, then.